Please be on the lookout for a red SUV with recent damage on the front end. Creative Loafing and WSB-TV report that Greg Germani, creator of the Atlanta Time Machine, Medlock resident and overall awesome guy suffered serious trauma and injuries and was taken to Grady Memorial after what appears to be an intentional hit-and-run on Flagler Avenue in Morningside. Any witnesses to this hit and run, please contact Detective Robert Jackson, APD Zone 2, (404) 816-7067.The victim's last name is actually Germani but it is listed as "German" on the police report. damage on its front end. 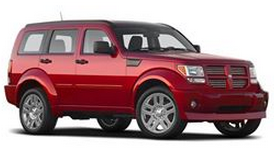 According to the WSB report, the vehicle may be a Dodge Nitro, and if so, would look something like this. Greg: hang in there, everyone's pulling for you! !